If you are unfamiliar with the worst storm in Great Lakes history, you might find plenty of opportunities to learn about it this year. This November marks the 100th anniversary of the Great Lakes Storm of 1913, the “white hurricane” — so named for its hurricane-force winds in a blizzard— that destroyed 19 ships and killed more than 250 people. 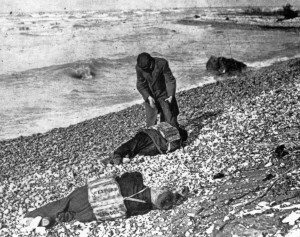 It was the worst maritime disaster to ever hit the Great Lakes, according to Paul Carroll, Canadian author of The Wexford: Elusive Shipwreck of the Great Storm, 1913 — a historical book about a steamer sunk by the storm and eventually found in 2000. Carroll is a member of a committee recognizing the centennial in Ontario. Plans are already underway in Great Lakes communities in the U.S. and Canada for centennial tributes, including museum exhibits, storm simulators and even a musical. The Cranbrook Institute of Science in Bloomfield Hills, Mich., now features the storm in its Extreme Deep: Mission to the Abyss exhibit, an interactive series of displays dedicated to deep-sea exploration, shipwrecks and aquatic research. Cranbrook and Michigan’s Port Huron Museum are working together to create 1913 storm exhibits. Port Huron museum has provided storm artifacts to Cranbrook, including a lantern and a porthole recovered from one of the lost ships. Cranbrook plans to loan the graphics created for its storm exhibit to Port Huron’s “Storm of 1913: Remembered” memorial this fall. The Port Huron Museum is sponsoring a bus trip and a chance to privately tour the Cranbrook exhibit for local residents and the tribute planning team today. The trip is intended to inspire ideas for Port Huron’s upcoming centennial. Susan Bennett, director of the Port Huron Museum, hopes the September tribute provides insight to what happened in the Great Lakes basin before, during and after the storm. “Port Huron was essentially ground zero during the storm, so it is definitely important to us on a local level,” Bennett said. 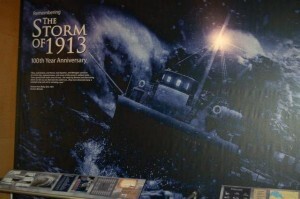 A Storm of 1913 graphic at Cranbrook’s Deep Sea: Mission to the Abyss Exhibit. Photo: Port Huron Times Herald. Lake Huron was the hardest hit by the storm, claiming the lives of 178 people. The steamer Charles S. Price was found floating upside down off of Port Huron — one of eight ships lost on Lake Huron alone — giving the city and its museum a special connection to the tragedy. Tentative plans include a series of concerts, Great Lakes lectures and a “Lost Legends of the Lake” dinner and memorial service over the weekend of Sept. 6-8, Bennett said. Members of the remembrance team also hope to bring back the “chautaqua,” a traveling festival with an educational focus that was popular in the late 19th and early 20th centuries. Like the traditional chautaqua, the museum’s revival will feature art, music, politics and famous speakers, Bennett said, though the festival won’t travel beyond Port Huron. “And of course it all falls under a Great Lakes storm theme. Can you tell I’m a little bit excited?” she asked with a laugh. Bennett isn’t alone in her enthusiasm over the storm’s history, and especially the chance to educate others about it. In Ontario, a small group of volunteers, along with the Port of Goderich and Lake Huron Shore communities, is honoring the lost lives and ships over an extended period in 2013. 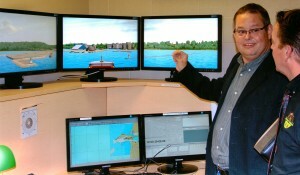 The Georgian College “Bridge” marine simulator showing the entrance to the Port of Goderich Harbour in Ontario. Photo: Mac Campbell. The group is working with other Great Lakes communities, particularly with the Port Huron Museum, to develop and coordinate events, said David MacAdam, chair of the Ontario-based committee. “We have a wonderful handful of people that are volunteers for this upcoming event and do have connections with the Port Huron group as well,” MacAdam said. “We enjoy attending their meetings and we hope they enjoy attending our meetings. “We are doing out best ensure there is harmony between the US and Canadian efforts,” he said. Museums and art galleries along the lakeshore communities will present special exhibitions, and the Goderich Little Theatre will mount the musical drama, November 9, 1913: The Great Storm. Goderich activities include a Trade show and job fair that includes the shipping industry, marine trade companies and marine heritage and education groups from across the Great Lakes basin. The Georgian College International Marine Training Program will also be a major player with their on-site simulators, which will allow attendees to see simulations of the storm’s effects on Great Lakes ships. Centennial events in Ontario will begin as early as March, and will culminate in a series of remembrance activities the weekend of Nov. 8-10. Thanks for the heads-up, interesting and tragically sad all the same.